Sine and cosine are trigonometric functions that come from graphing the y or x value, respectively, of a point as it traverses the circumference of a unit circle in a constantly changing radial angle from 0 to 2π radians. The cosine is actually exactly the same as the sine with a phase offset of π/2 radians, which is to say starting 1/4 of a cycle into the sine function. To talk about any such function, regardless of phase offset, we can use the noun sinusoid and the adjective sinusoidal. It happens that the sinusoid is also the graph of simple harmonic motion, such as the natural oscillation of a pendulum or the simple back-and-forth vibration of the tine of a tuning fork or an alternating electrical current. Simple harmonic motion is oscillation at a single frequency, so the sinusoidal wave is the most basic "building block" or elemental unit of all sound. 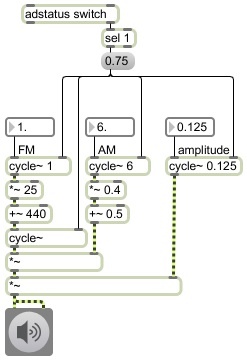 The cycle~ object in Max acts as a wavetable oscillator for generating periodic signals, and by default it uses the cosine function. (Internally it is actually reading from a 512-point lookup table, and interpolating between those points as necessary to generate a smooth signal at any frequency.) Its peak amplitude is 1; it oscillates in the range from 1 to -1. Every time you turn on audio signal processing in Max, all cycle~ objects begin in cosine phase--i.e., starting at 1. However, you can supply a phase offset in the right inlet, so to make a cycle~ start with sine phase, you must supply a phase offset of 0.75 to start 3/4 of a cycle into the cosine function. The sinusoidal oscillator can be used at an audio frequency as a carrier oscillator, or as a control function at a low frequency (or indeed any frequency) to modulate other signals. Since the sinusoidal oscillator was a basic generator in almost all early electronic synthesizers, we have become very familiar with the sound of using one oscillator for sinusoidal modulation of another oscillator's frequency and amplitude to create vibrato and tremolo effects. A singer or flutist will generally use a combination of vibrato and tremolo -- modulation of both frequency and amplitude of the tone -- for expressive effect at a rate somewhere between 5 to 8 Hz. Electronically and digitally, of course, we can modulate a tone at any rate, from extremely slow (such as 1/20 Hz) to audio rates (such as 2000 Hz). So we can use these different rates for sinusoidal control functions at the phrase level, the note level, or the microsonic timbral level. This program demonstrates the use of the sine function for low-frequency modulation of a tone. 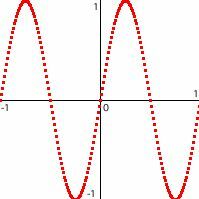 One sine wave is the carrier oscillator that we actually hear, and the other three sine oscillators are the modulators. When MSP is turned on, that fact is reported by the adstatus object, and that report is used to set the phase offset of the cycle~ objects to sine phase. This ensures that they all start with the correct, identical phase offset. 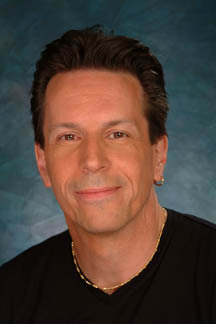 The frequency is modulated + and - 25 Hz around a center frequency of 440 Hz. That's + and - about a semitone, so it fluctuates between approximately Bb and Ab around A 440. The amplitude is modulated + and - 0.4 around a center amplitude of 0.5. That's a total range from 0.9 to 0.1, which is a factor of 9, which is about 19 dB. Both of those ranges are larger than most singers or instrumentalists would ordinarily use for expressive vibrato, but they're made deliberately large here so they'll be obvious. The tremolo (amplitude modulation) rate is 6 Hz, which is about normal for idiomatic instrumental vibrato. However, the vibrato (frequency modulation) rate is only 1 Hz, which means it glides fairly slowly -- slowly enough that we can track its pitch -- and we tend to hear its extremes, Bb and Ab, as the main pitches. Interestingly, if you adjust the vibrato rate to be 6 Hz like the tremolo, the vibrato will be so fast that -- at this still fairly narrow pitch interval -- we tend to hear its center frequency, A 440, as the main pitch. A third, very slow modulating sinusoid is used to shape the overall amplitude over a longer period of time. Its frequency is 1/8 Hz, which means that it completes one full cycle every 8 seconds. So, every 4 seconds it goes from 0 to peak amplitude (+ or -) and back to 0. Therefore, we hear a complete crescendo-diminuendo every 4 seconds. Even though the waveform is inverted when this modulator is negative, we don't perceive that fact when we listen to the tone in isolation, so amplification by a negative factor (the second half of the cycle of the modulating sinusoid) sounds the same to us as amplification by a positive factor (the first half of the cycle). You can experiment with some different rates of modulation, including very slow and very fast (even audio rate) speeds.